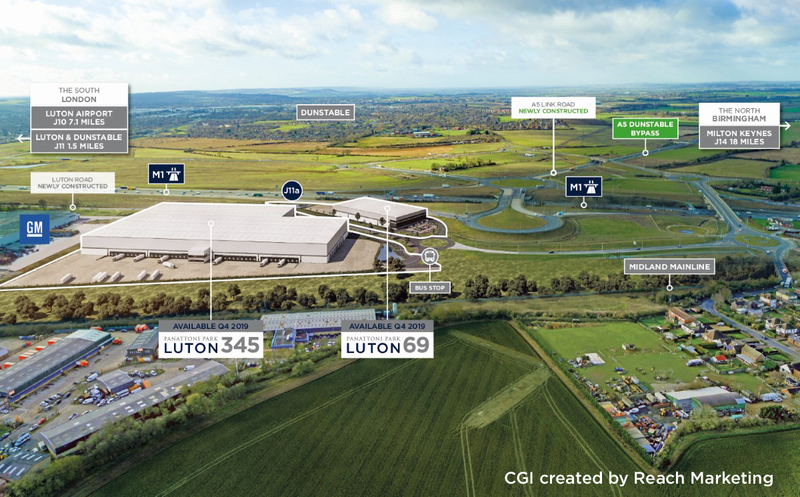 Panattoni, the world’s largest speculative logistics developer has commenced the development of Panattoni Park Luton, comprising Luton 345 and Luton 69. Panattoni Park Luton is located on one of the most prominent and advantageous sites on the southern M1, immediately adjacent to the newly built junction 11A which provides fast access via the M1 to the A5 north of Dunstable. The development consists of two units, one of 345,000 sq ft and one of 69,000 sq ft, with a GDV of £80m. Luton is an established industrial and logistics location, and has already attracted a variety of prestigious companies, with Panattoni’s development located immediately north of Vauxhall Motor’s long- established logistics facility. Panattoni Park Luton benefits from excellent road connections. Central London is merely 36 miles away and the M1 / M25 intersection is 17 miles to the south. Furthermore, Luton Airport is just seven miles away and the site is within easy HGV drive times of major UK ports including Felixstowe, London Gateway, Southampton and Dover. In addition, there are proposals for a new link road from junction 11a of the M1 to the A6. This will improve the scheme’s access to the A1, bringing the east coast ports closer and opening up the East Midlands. Occupiers can also take advantage of a skilled warehousing and logistics workforce within easy driving and cycling distance. There are 1.8 million people living within a 45 minute drive, with 9,000 skilled in transport and storage work. The site will also benefit from its own new dedicated bus route and bus stop. James Watson, Development Director of Panattoni UK, said: “We are dedicated to providing only the best quality buildings in the best locations and Panattoni Park Luton fulfils these ambitions. Panattoni Park Luton will be ready for occupation in Q4 2019 and agents for the scheme are Savills and M1 Agency. Ground breaking event. From left to right: Danny Nelson, Director, Winvic Construction; Ben Shearman, Operations Manager, Winvic Construction; Andy Hall, Partner, M1 Agency; Sue Glantz, Business Investment Officer, Central Bedfordshire Council; James Watson, Development Director, Panattoni.